Marcos Luna, Ph.D., professor at Salem State University in Massachusetts, has spent much of his career using his skills in GIS and statistical analysis to help communities answer questions that are meaningful to them. Most recently, he provided data that is helping low-income and minority people in Boston achieve equal representation in transportation decision-making and challenge new transit changes. GIS and stastical analysis of representation on the Boston-area transportation planning organization revealed that the suburbs had the most voting power (darker oranges in left map) and represented the least percentage of the total population (lighter orange in middle map) and were more heavily white (dark orange, right map). Courtesy of Marcos Luna, Salem State University. A long-standing relationship between Luna and a community group called Alternatives for Community and Environment led the group to contact Luna about their concerns that transportation decisions were biased toward the suburbs while shortchanging the interests of the inner city. Inner city Boston is home to many low-income and minority communities who depend heavily on public transit, especially to get to and from work. “They had suspected a structural bias for a long time, and I offered to analyze it statistically to figure out whether there was a bias from a quantitative perspective,” Luna said. 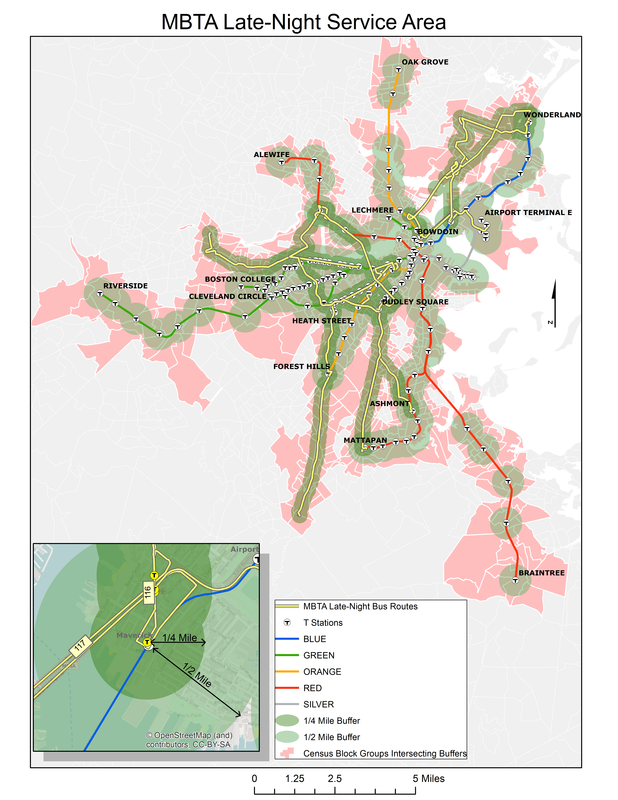 The Boston Region Metropolitan Planning Organization plays a key role in planning and allocating funding for transportation in the greater Boston area. To find out if representation within this organization differed according to where someone lived, Luna combined GIS technology and statistical analyses to identify communities falling within certain jurisdictions and to classify the demographics of those communities. This data was used to file a legal complaint to with the U.S. Department of Transportation (DOT) Office of Civil Rights. Luna also published a paper detailing the analysis. A correct equity analysis showed that canceling late night bus and subway (T) service disproportionately impacted low income and minority communities. Courtesy of Marcos Luna, Salem State University. Luna also worked with the Alternatives for Community & Environment, Conservation Law Foundation and Greater Four Corners Action Coalition to provide data the groups needed to file a complaint with the DOT asserting that a decision by the Massachusetts Bay Transportation Authority (MBTA) to cut late-night service discriminates against low-income and minority people living in Boston. Since 2014, the MBTA had run an extended late night service on certain bus and subway lines until around 2:30 a.m. In February 2016, the agency announced it would stop the service even though it had not conducted a legally required equity analysis to find out whether the cancelation would disproportionally affect minority and low-income people. The MBTA had performed the equity analysis using around 175 cities and towns, even though the late night service ran through only around 30 communities (see these maps for a comparison). Decades of research have shown that only people living close to a bus or subway stop use it regularly. In fact, the DOT Office of Civil Rights specifies that this type of equity analysis should consider only people living within a quarter mile of a bus stop and a half mile of a subway line. The complaint was filed in July 2016, and the community groups are waiting for a response from DOT and MBTA.